Scanning for Reward over Risk Ratio — s.c.a.n. Many technical analysts have strongly recommended to only buy stocks which have a potential Reward/Risk of more than 3. Looking back over 3 or more runs to determine the average gain (reward) and the size of the stop that would have been required to get into the position at the bottom (risk) takes a fair amount of time if you are doing it on a lot of potential stocks you are considering. So, I have some questions. 1. Is there a way to scan for this? 2. Is there a way to scan for a surrogate of this? 3. If there is no way to scan for either, is it legitimate to do this for say 100 stocks you would consider (scattered over the various sectors you would like to buy) and expect that if a stock had a Reward/Risk of 4.5 - 6 in a previous rally (say 3 years ago) that it will likely have a Reward/Risk of over 3 in the rally that is starting? I wouldn't forget about the 3 to 1 rule - it's usefulness is to remind you to get in close enough to support that, if buyers fail to hold on to the initiative, your risk is less than if you wait for "confirmation". But in very strong situations, where you believe its very unlikely the stock is coming back, you might choose to relax the rule. Here's a scan. Note this does not look for an entry, only stocks that might have a better chance of working out when a set up of your choice does occur. You can adjust the sma lengths and the look back periods to your preference. If you make the look back periods longer (than 10 and 21), then you should also check that the smas are still rising currently (add a second statement under // 63 MA is rising and //251 MA is rising). A long look back period gives them time to turn down. So for instance, for the 63 MA you might use 30 and 5, and for the 251 MA 50 and 5. CINF Jun 17 is an example where you might not observe the 3 to 1 rule. 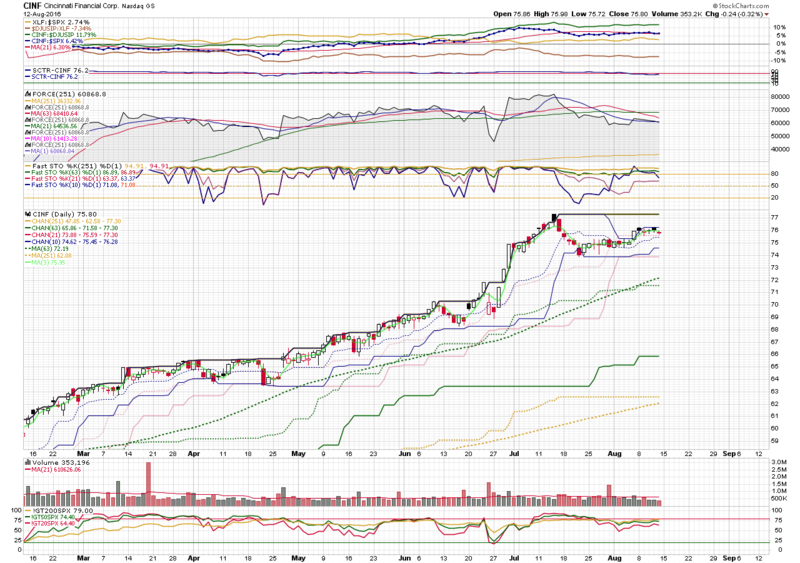 The stock is showing little tendency to pull back very far. On Jun 17, it fails to make a new low close on heavy volume, so buyers are supporting it. The mini decline was on low volume, so sellers aren't very active. No signs of distribution yet, which usually begins off the top. But Jun 20 it opens high - no chance to exercise the 3 to 1 rule. It's 2 points down to support around 68 but only 20 cents or so to the prior high Jun 9. Not really an ideal entry, but is it going to drop a full 2 points and not come back after getting so much support on Jun 17? As always, anything could happen but the probability is low. If you wait, it could pop up Jun 21 and leave you permanently behind. If you took this trade (because it was better than other trades you are looking at at the time) you could take a smaller position to compensate for the wider stop if that make you more comfortable. Note: the decline on Jun24-27 was Brexit - so it was general market selling, not selling related to the accumulation/distribution position of the stock. If you go through her charts you will see that not every set up (%K < 20, in the "Green Zone") works (signal occurs too soon, or buyers jump the gun before selling is truly done), but many pay off very nicely. ( I like Fast K 10 < 20, or even Fast K 21 < 20 because I think there are fewer false signals, BUT, the trade off is, if you are strict about waiting for < 20, you will miss some trades that Slow K 5 catches). Assuming your are entering on retracements, and not breakouts, if you are in an uptrend, unless you see signs to the contrary, you can assume the previous high will be broken, because that what it means to be in an up trend. So that recent high is your minimum upside target (that's not to say it's your exit, just a price to calculate a "probable" minimum reward). Or to be more conservative, you could choose the support level that was broken to end the prior leg up as your upside minimum target. I don't think you can estimate how much further beyond the previous high it's going to go (unless you want to learn Wyckoff's P&F count method, or maybe you could explore fib extensions), so that doesn't really enter into the risk/reward calculation. The purpose of the risk/reward calculation is to minimize your losses, not maximize your gains, so you want your "guaranteed" portion of the reward to be 3x your planned "maximum" loss. Then you need to look below the current price for likely support. Depending on the situation, that could be the low of the current down leg, or the low of a prior down leg, or maybe a high volume up bar low in a prior up leg, or a test of that bar above it's low. If the ratio is greater than three, the "rule" says it's a trade worth considering. There are a couple of ways to get to that ratio. One is to have a large drop (leg down), the other is to make an entry very close to the low. The ironic thing is, both a large drop and a return to the low are relatively weak behaviors. Really strong stocks don't drop much, and they usually don't hang around at their lows. So, if you come across a really strong stock - price above the definitely rising intermediate and long MAs (and the intermediate MA increasing its distance above the long MA), you might not insist on the 3 to 1 ratio. I think its much more important to be sure of the trend, and that the current counter move is sold out, than it is to meet the 3 to 1 test. I think that's really for traders who want to trade all the time, rather than waiting for the ideal situation. As for scanning, you might try scanning for a high below some per cent of price channel, but that doesn't guarantee you are near viable support. (For instance, if you assume an entry above high that is below 20 per cent of the 21 day channel, your risk is about 4 to 1. BUT, the bottom of the channel may not represent real support, and getting such a bar may indicate the trend is weak at that point). 1. Am I right that rather than worrying too much about the 3 to 1 rule, you would rather focus on finding a "really strong stock - price above the definitely rising intermediate and long MAs (and the intermediate MA increasing its distance above the long MA)"? 2. Is there any chance you would show me some scan code to scan for that? I am almost to the point of writing that, but not quite. Thanks @markD for both the scan and the chart of CINF. A straigtforward way to scan for reward/risk"